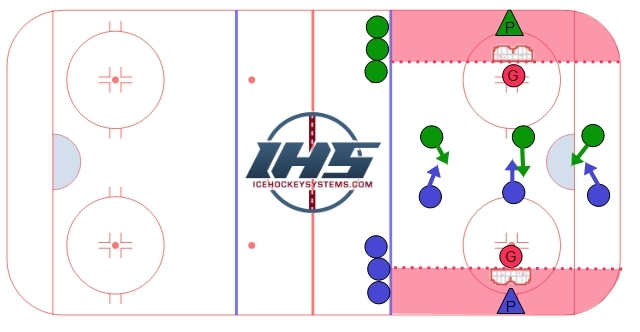 This 3 on 3 cross ice game is similar to the Gretzky 3 on 3 but now the designated passers are referred to as "Bourque". The "Bourque" is now behind their own goal line and must initiate breakout passes. The nets should be placed a bit closer to the boards to allow more room for executing breakouts. Players must use their "Bourque" on a change of possession before making an attempt to score. Players may attack the other team's "Bourque" but they may not shadow them. There is no limit to how often a team uses their "Bourque". Shifts should be 30 - 40 seconds to keep a good pace and high intensity. Have the "Bourque" work on a good first pass. Use "false Information" (looking off the pass) to get their players open. Players need to skate back to support their "Bourque". Fill three lanes and skate to open ice.